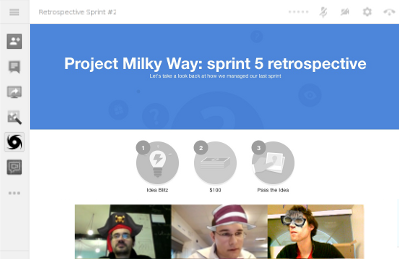 Conduct a retrospective with a remote team using Google Hangout. Post positive, negative or neutral feedbacks about the sprint. During this time, your cannot see the feedbacks of other participants. At the end of the first phase, participants are able to see others' feedbacks. A great support to start the discussion. Individually participants will choose the most important point to improve for the next sprint. Because the vote is personal, rogue people cannot bias the vote by voting at the end. 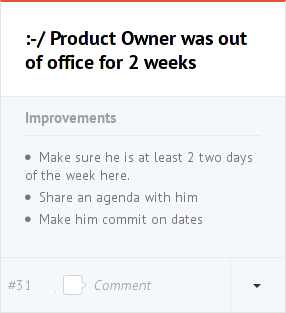 Among the most important points, you will find collectively some actions to do for the next sprint. Don't make a photo of your board but share the URL. Audio, video and chat included, thanks to Google Hangout. 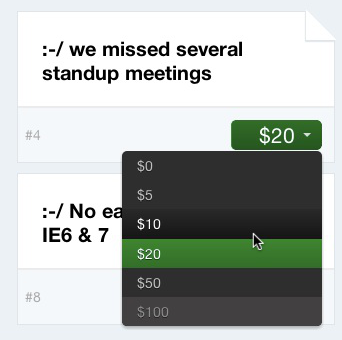 It's integrated into the same interface as Hangout you know and love.